What's the Secret to Great Skin Care? Experience Matters. 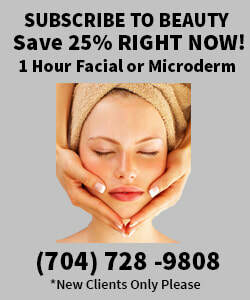 Lorrie Emory has been catering to the skin care needs of Women and Men in Cornelius, NC for over 20 years. She's got the best equipment in the business, like her Crystal-Free Diamond Microdermabrasion machine. But it's her dedication, caring and knowledgeable application of her skills that really shines through. You deserve the very best and you've come to the right place. Give Lorrie a call. She's here to answer any questions and ready to provide you the best skin care treatments in Cornelius, NC you've ever had. Satisfaction Guaranteed! Microdermabrasion can achieve dramatic results, but it is highly dependent on the skill of the esthetician. A few years ago Lorrie wisely invested in a DiamondSkin™ Crystal-Free Microdermabrasion Machine, the most advanced technology in the business. This crystal-free microderm process introduces an aesthetic experience not found in conventional, crystal-based treatments. This diamond microderm treatment will visibly reduce the signs of aging. A deep mechanical exfoliation will smooth fine lines, polish away age spots, and revitalize skin’s tone and texture. This treatment includes extractions, light facial massage, appropriate masque, and moisturizing. This Microdermabrasion Concludes with oxygen infusion. Good for all skin types. A professional facial should be given by a licensed esthetician with special training in skin care. They are sometimes also called aestheticians or facialists. Your facial will typically include deep cleansing, careful skin-type analysis, appropriate exfoliation techniques, extractions (ouch!) massage, masque, toners and protective creams as indicated. Click for facial details. A Chemical Peel or Skin Peel involves the application of a specific solution to the surface of the skin to peel away the outermost layers, revealing the fresh skin beneath. This chemical peeling method is used to treat a variety of skin conditions including acne, rosacea, fine wrinkling, blotchy pigmentation, ingrown hairs, yellow complexion and dry skin. Whether it's our advanced AHA chemical peel or the highly effective Jessners Peel, Lorrie's got you covered. There are many benefits to waxing versus other forms of hair removal. It is an effective method to remove large amounts of hair at one time. It is a long-lasting method. Waxing the hair will prevent regrowth for two to eight weeks. When hair is shaved or removed by depilatory cream, the hair is removed at the surface rather than the root. Within a few days, the hair can be seen at the surface. With these methods, hair tends to grow back in a rough stubble. Areas that are repeatedly subjected to waxing over long periods of time often exhibit regrowth that is softer. The process of eyelash tinting involve the careful placement of a semi-permanent dye to the lashes, creating the dramatic visual effect of having darker, longer, fuller eyelashes. Eyelash tinting is one of the fastest ways one can enhance their eye features at a minimal costs. Eyelash tinting affords women the assurance that their lashes will look picture-perfect all day.